GBP is under pressure due to reports and the polls; the Great Britain is also publishing manufacturing PMI data. 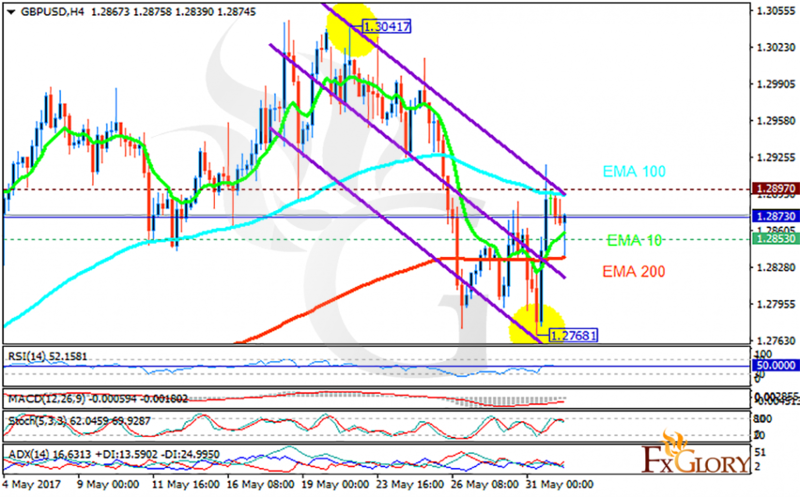 The support rests at 1.28530 with resistance at 1.28970 which the weekly pivot point at 1.28730 is located in between the lines. The EMA of 10 is moving with bullish bias and it is above the EMA of 200 and below the EMA of 100. The RSI is moving horizontally on the 50 level, the Stochastic is showing downward momentum and the MACD indicator is in negative territory. The ADX is showing weak sell signals. The bears are taking the control of the chart targeting 1.260.